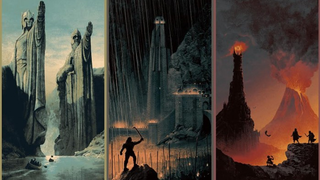 Matt Ferguson's gloriously geeky art is well known for its awesomeness (as well as its ability to promptly sell out the moment it goes on sale) - and this latest trilogy of posters inspired by the Lord of the Rings is no exception. You've only got until the end of this weekend to buy it though! Pretty damn spectacular. I love the glow of the braziers across the battlements of Helm's Deep. Each poster will set you back $35, or the whole set can be got for $100 (or for $300, printed onto Wood, which sounds ludicrously fancy and awesome). You can order them over at the Bottleneck Art Gallery, but don't forget - you've only got until the end of Sunday if you want some!